How to original package a gift? Important packaging or it does not matter at all, because the content does not change in any way depending on it? Look for answers to these questions in our article! Give gifts you need to be able to. And it happens, you choose some beautiful thing, you put your whole soul into the purchase, but in the end, no special attention is paid to your gift. Perhaps, the whole thing in the package, after all, it is equally important to present the gift in a beautiful way. So, let's figure out how to pack gifts. Of course, the easiest way to go to the store andAsk a smiling seller to pack your present. But here there are two pitfalls. First, the appearance will be standard. And this means that you again will not stand out from the general mass. Secondly, not always the seller is a professional. So the chance to get a carelessly wrapped present only increases. Well, the last argument against the storePackaging can be the fact that even in the most beautiful shop wrapping paper, there is no personality of the giver. Therefore, if you want to make a truly amazing gift, then we advise you to spend a few minutes doing it yourself. In addition, in this way you can evenSave, because quite often to decorate the presentation you can use improvised materials. For example, if you want to do something nice just for your loved one, then you can use ordinary office paper in A4 format. All you need to do is print on it.A few phrases about their feelings, as shown in the picture. And then the one who will receive the present will not only be pleasantly surprised, but also well informed about your feelings. By the way, if it's hard for you to overcome indecision, then in this way you can confess your love. 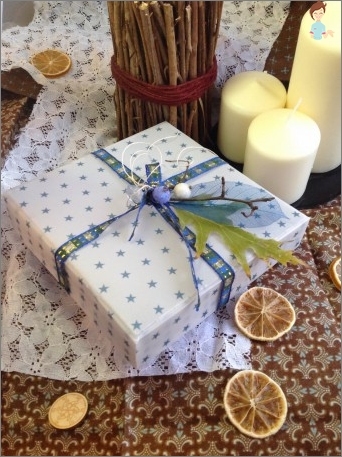 To decorate the box, you can not useOnly ribbons and papers, but also natural materials. To do this, you can attach a piece of wood or a small piece of sea coral to the gift wrapping. Attention! Such an original gift wrapping is suitable only in cases when the addressee can appreciate the idea. If a piece of wood causes, at least, bewilderment, and coral - disgust, then it's better to do with standard decorating methods. First of all it is necessary to say that when decoratingYou can use paper not only as packing material, but also for decoration. For example, if you have a few old postcards at your home, which were still being collected by your great-grandmother and great-grandfather, do not rush them into garbage. You can cut several motives and justPaste on the packaging. The main thing is to select the cut out material so that the images are combined either with the contents of the presentation, or with the personality of the addressee. And if you create some interestingApplication, you can not even doubt the receiver's delight. But you should remember about one more nuance: place the application on the box in such a way that when you print it, you can not damage it. Otherwise, all your works will be in vain! 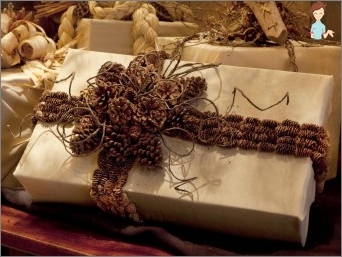 In order to originally pack a giftYou can use not only ordinary paper, but old newspapers. But be careful. If the present looks untidy, then you may be suspected of trying to save money. And this clearly does not accompany the development of friendly relations. You can experiment with tape. You can tie it in a standard bow, or you can make an original ornament using a punch hole on the ribbon. Such a leaky, but cute ribbon can simply be glued on the box. And twist the edge into a bagel. As a result, the gift is absolutely uniquely packed. By the way, if you feel pity to throw waste away fromTape, then you can use them as confetti. But such an addition to the gift box should be done only if the recipient has nothing against the unscheduled cleaning. And then you can spoil the mood! For gift packaging yourself, you canUse even garbage bags. The main thing is that they are clean! In order for the present to look beautiful, we wrap it in several trash bags, which must necessarily be of different colors. Then gently straighten the edges of each crochet to make a volumetric bow or flower, who has any imagination. To create a beautiful composition, you canUse and fresh flowers. And it is not necessary to give a bouquet. You can attach a beautiful bud with a scotch instead of a bow. You can complement the decoration with a simple ribbon. The main thing is that you can pick up all the elements of the decor in about one range. 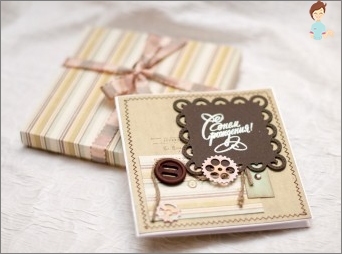 And if the color of the box is contrast, the memorable appearance of the presentation is guaranteed to you. By the way, if the person to whom you give presents,Is fond of Japanese culture, then you can pack a box in the style of furoshiki. For him, you need a square piece of fabric, the print on which should resemble Japanese motifs. Then, following the diagrams below, you can pack both rectangular and round objects. Using a self-packing method, you do notLeave indifferent any person, because it has long been known that all things done take over a piece of the master's soul. So, that by making such a gift, you give a close person a piece of yourself. All the methods of decorating the presentation described above are certainly beautiful. But they have one minus - decorated, so a gift you do not Give to a man. Since the supportive reaction of a representative of the strong half of humanity to flowers, pieces of wood or ryushechki you will not wait. So now we will think with you howMake an original gift to men. After all, picking something really interesting is incredibly difficult. We suggest you make a gift wrap in the form of a man's shirt. It is, of course, a little more complicated than fitting a piece of a flower or colored paper to a ribbon, but for the sake of a close person, you can put a little more effort. Well, of course, patience, because the robot we are withYou have to work hard. But do not despair, the pots are not burned by the gods, so you will succeed! To create a shirt package, you need to fold the paper strictly in the order shown in the picture. By the way, if you decide Give your beloved man Tie, then you can pack a box in the form of a tie. To do this, you also need to carefully repeat all the steps shown in the following figure. And then the package will display the contents of the gift. The main rule of packaging for men's gifts -Avoid all sorts of flowers, ruches, lace. Do not choose too bright wrapping paper. The best option is either glossy gray or dark blue. And if the addressee is fond of travel, then you can use paper for packaging with a map of the world. As you can see, packing a gift with your own hands, youNot only add to your gift of originality and allocate it among all the others, but also give a piece of yourself. Therefore, the issue of decoration should be treated with great responsibility. Be sure to try to convey in the package your feelings towards the person who will receive this gift. And believe me: even if for the first time your packaging does not turn out to be perfect, it will still look much more interesting than a regular store template! Good luck!